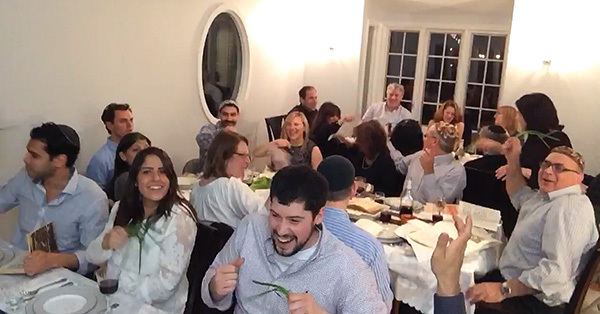 Dina Davidyan’s seder guests tap each other with scallions during “Dayenu,” a Sephardic tradition. In the weeks leading up to Passover, North Shore kitchens are a flurry of activity. Ketchup, ginger ale, and onion soup are poured into a bowl to season brisket. Matzah cake meal and potato starch are sifted together through a mesh bottom sieve to make a Pesach sponge cake. And for the haroset: almonds, walnuts, hazelnuts, raisins and dried dates are put in a blender and then soaked with Manischewitz wine. 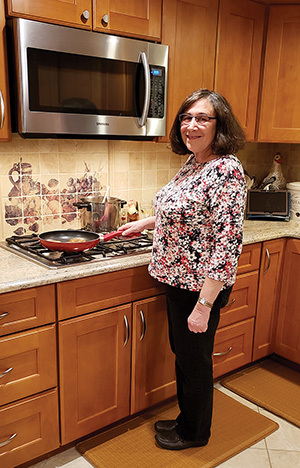 For four North Shore women, Passover is a holiday of food and memories intricately intertwined with one another, full of tastes and smells that transport them to different times and places. Laura Goodman prepares for Pass­over in Marblehead. Now, with thousands of Kosher-for-Passover items available, and a massive Passover aisle at Stop & Shop in Swampscott, the sky’s the limit. “Now we’re not hurting for anything – we have the chocolate mousse cakes, kiss torte, we have brownies, all things that are Pesadich, because so many more things have been accepted into the seder.” These days, Wolper puts out brownies made with bittersweet chocolate, margarine, and either matzah meal or matzah farfel. In recent years, oranges and rice have found their way onto Ashkenazi seder plates because many Ashkenazim have taken on Sephardic customs for Passover. Dina Davidyan, an Israeli of Romanian descent now living in Beverly who is married to Eli Davidyan, an Israeli of Persian descent, embraced the Sephardic Passover customs many years ago. There are several differences between Sephardic and Ashkenazi seders: while traditional Ashkenazi seders ban rice outright, Sephardic seders feature two different kinds of rice, which are incorporated into a fried tzimmes. Instead of gefilte fish, Sephardim enjoy a cow’s tongue stew with wine, potatoes, and onions. “You wouldn’t even know it’s a tongue, it’s so soft,” said Davidyan. The matzah ball soup broth is dense and creamy and yellow, as opposed to clear and watery, and lettuce is used instead of parsley to dip into salt water. During the singing of Dayenu, everyone taps each other with large scallions to imitate the lashes of Egyptian whips. “You should see the Ashkenazi who come to my house for the first time – they are shocked,” said Davidyan. Guests at Mona Pessaroff’s seder in Peabody may not whack each other with scallions, but they do wear masks and sport finger puppets. “Even if it’s all adults, I have masks for the plagues, and I have finger puppets for the plagues, just to make it fun,” she said. Pessaroff, who works at the North Suburban Jewish Community Center in Peabody and was married to the late Cantor Sam Pessaroff of Temple Ner Tamid in Peabody, cooks her mother-in-law’s sweet potato casserole, her maternal grandmother’s toasted farfel pilaf, and recipes from workshops run by her friend Vicky Morheim, like Sephardic haroset.